A Marine Corps veteran awaiting trial for a failed car bombing was arrested after authorities found an astonishing stash of weapons at his Bronx home, including a grenade launcher. Richard Laugel, 38, “presented an extreme danger to the community,” law enforcement officials said Thursday, announcing he was in federal custody after a day-long manhunt. 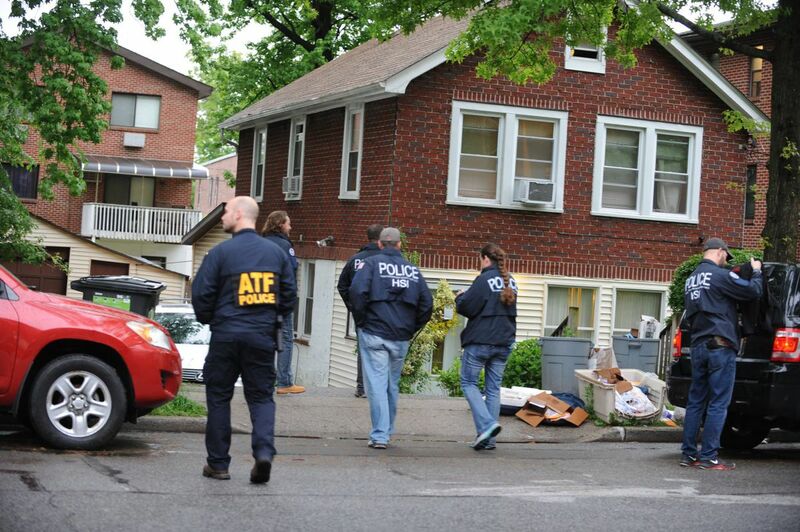 The NYPD and Homeland Security agents found three pistols, firearms silencers, a grenade launcher, an AR-15 rifle and a teddy bear that contained approximately 30 grams of cocaine in his Palmer Ave. home in Baychester, officials said. “From what was found during this investigation, he appears to be a threat to public safety and someone we don’t want on the streets,” Homeland Security Investigations Special Agent-in-Charge Angel Melendez said. Laugel, an Iraq veteran, lived in the home with a woman and her two children. Authorities searched the home on Tuesday while investigating a drug dealing operation, prosecutors said. A criminal complaint revealed authorities had noticed Laugel made suspicious PayPal payment for pill-making materials from China. In addition to the weapons stash, investigators also found plastic molds used to make the lower receiver of handguns, firearms barrels, a drill press and milling machines used to make firearms, according to a criminal complaint in Manhattan Federal Court. Laugel was arrested Wednesday without incident. “Laugel’s alleged conduct presented an extreme danger to the community, and we are grateful that he will now face prosecution,” ATF Special Agent-in-Charge Ashan Benedict said. Laugel is already facing arson and attempted murder charges for allegedly planting a makeshift nail bomb under a 24-year-old man’s rented Nissan hatchback in 2016. The device exploded as the victim and a woman were driving in Pelham Bay on March 2, 2016. The blast sparked a fire, damaged the vehicle’s undercarriage and set off its airbag, but no one was injured.